It is a sunny day so I have to take Mama outside. We decide to walk around the Alaskan Reservoir which is right by our house. We climb up up up. Way up high! Hand please. There are some yummy plants here. They really not ready to eat yet but we will come back. At the top of the hill we can see the Mountain and the hospital and all the steeples. I run around on the flat field and then I run down the hill. We come out on a grassy slope. Oh, park! 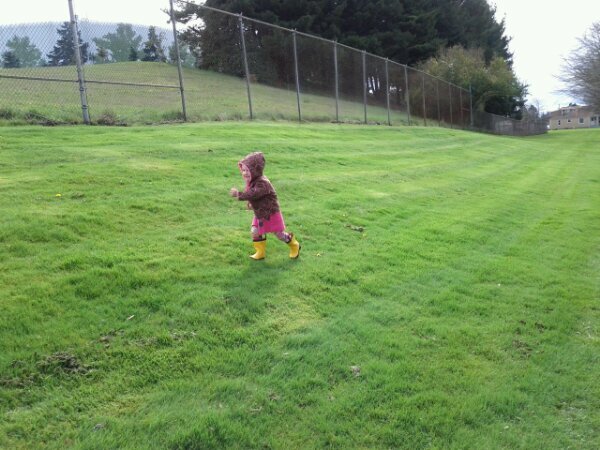 Mama says we can walk on the grass so I am storming across the squishy grass in my boots. That is when I see a mushroom. Then another. And another! One two three seven eight! All them! 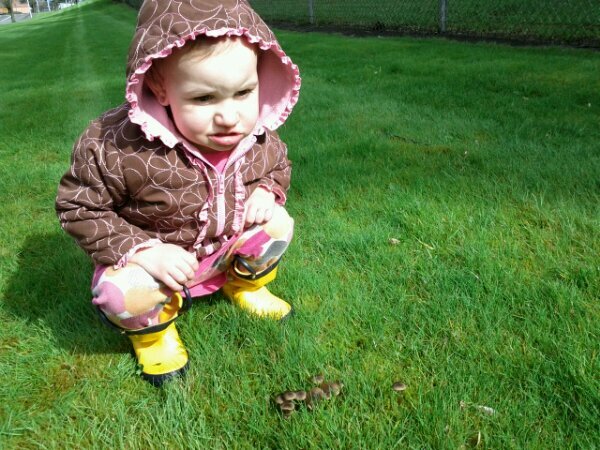 When we are outside we don’t touch mushrooms unless we have our special mushroom knife. So I use my naturalist eyes. Here some! Here some. Different. More mushrooms. Little mushrooms. Brown. There are more treasures in the grass. Mama! Yellow flowers! Pick okay! I fill up my hands with happy dandelions. Some are up the hill and some are down, so I hop like an Easter bunny to catch them all. We are almost home. A big dog jumps up on his fence. Dog bark. Mama, dog is barking. That’s enough, dog. In the garden we have tomatos growing and also some berries. We used to have cherries but I ate them all gone. My teeth keep poking me. I don’t like it. It makes me feel grinchy and like there’s not enough milk left in the world. I’m pickier about food and I don’t like to eat very much at one time. My mouth gets tired. 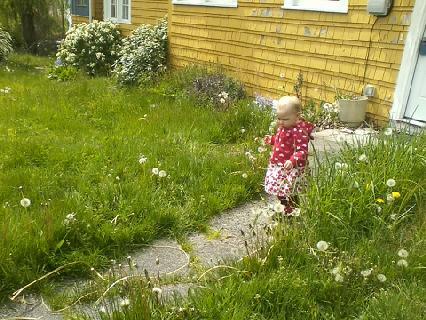 It’s summer so it’s just time to forage all the time. 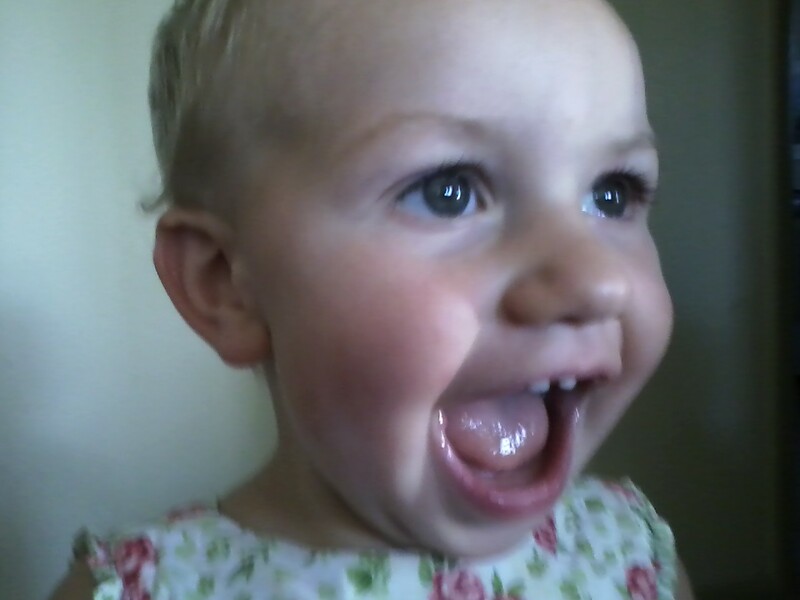 Me and Iris went out to get blackberries at Mimee’s friends’ house. There were so many and lots were close to the ground so I filled up my belly. We got to walk around and see all the new trees. They will have apples on them, or as I like to say “Apps.” You don’t even need a smart phone to get food from plants. Mixed in with the blackberries we found salal, blue huckleberries, and thimbleberry plants. I never tried salal before but Mama looked it up in her book and it said “safe” so we all tried some. I make sprouts, which have prety much every vitamin and enzymes and everything that’s good for you. It’s very easy. We put some seeds in a jar with lots of water for one night. 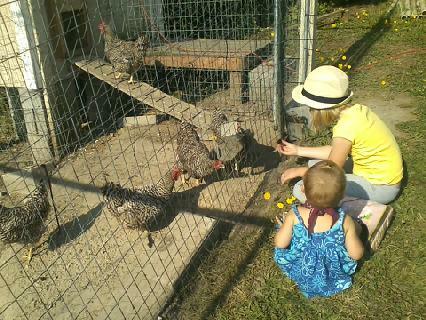 Then every day at morning and night we rinse them with water until they’re big and green. I love them and eat them in big handfuls. Sometimes the handfuls are too big like in this picture. They are crunchy and fresh and wet and the flavor is a bit sweet. Even kids who hate brocolli probably love sprouts. Except brocolli sprouts. 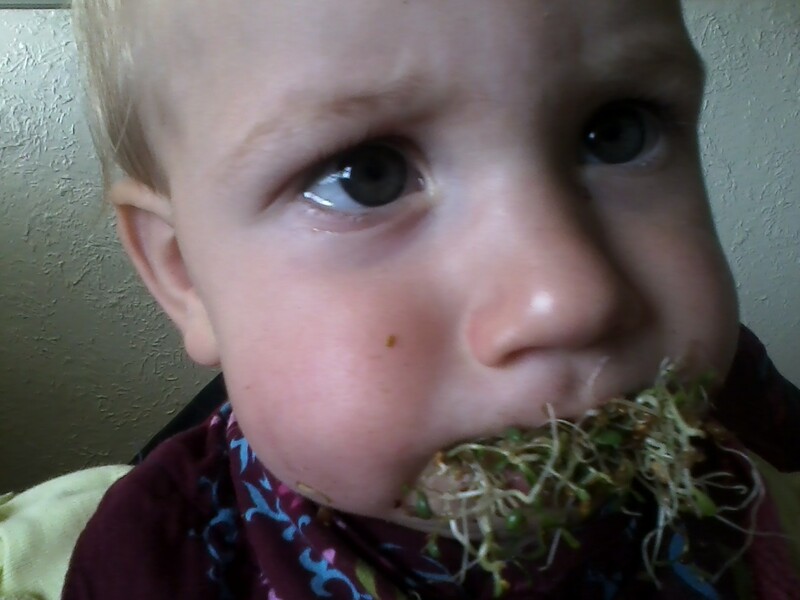 My favorites so far are alfalfa and mung beans. We’re going to try adzuki next. My other favorite snack today is cherries from our tree. We have a grafted tree so some are red and some are yellow. I say “berry? Berry?” and my Mama knows what I’m talking about. 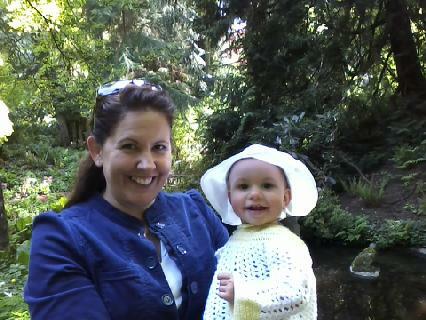 For Mimee’s birthday we came to the Bloedel Reserve. I took a nap in the forest but when we got to the house I woke up. I had to pee, so good thing. We sat in the sun and then started on our walk through the lower gardens. I love flowers because smelling them is so nice. I love Mimee. Her and flowers go together. Da came on our walk today to play at the Yellow House. 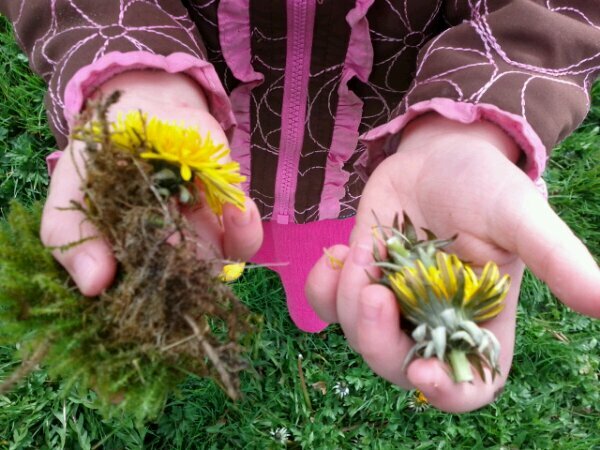 We picked dandilions and blew the seeds. I tried to blow the seeds but they kept getting in my mouth. They feel weird. Mama and I sat on the sidewalk and listened to the birds. A hummingbird flew right by us and I could hear it click as it went up high. We want to live here because it has a big meadow in the front and a forest in the back and a playhouse and a climbing tree and a million flowers and bugs. We could still walk to see Mimee and Poppy. We could plant seeds and make a secret fort. Now we’re going home; it’s naptime.